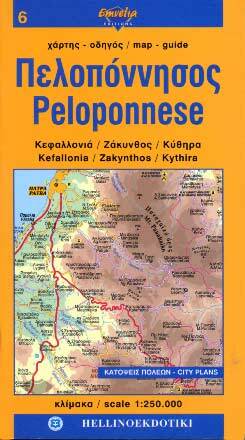 A handy, reliable and updated map-guide with road network of Peloponnese, and the islands of Cephallonia, Zakynthos and Cythera. - Colorful plans of the cities and of the archeological sites. - Alphabetic index of town - villages, with altitude and population, and useful information with hotel & camping list. - It includes the prefectures of Corinth, Achaia, Ileia, Arcadia, Argolid, Messinia, Laconia, Cephalonia, Zakynthos and Cythera.